The current manufacturing landscape is highly competitive. Pharmaceutical companies are forced to discover new ways to improve their efficiency and reduce operational costs. Below are five ways companies are streamlining their labeling processes to survive the competitive industry climate. We don’t have to tell you that the pharmaceutical industry is one of the most regulated in the world. We also don’t need to tell you about the ramifications of failing to meet the regulatory requirements in a country where your company does business. National and international regulatory bodies are placing increasing demands on drug manufacturers, pushing for greater transparency and clarity in labeling. The most efficient way of meeting these requirements is through a standardized label management process that enables you to update label information centrally and ensure that all local label production operates from an updated database. Pharmaceutical packaging is becoming an increasingly complicated affair. With so many companies involved in providing different levels of packaging, it’s more important than ever that you have a standardized process for label production. This is the only way to avoid inaccurate labeling information creeping into the production process. Pharmaceutical prices are under pressure. Consumers, regulatory bodies and health agencies are demanding cheaper medicine. Operating in a price-focused market means pharmaceutical companies must find more efficient ways of doing business. Standardizing label production can mean big productivity gains for your organization. It reduces time spent on manual data entry, enables more efficient label printing processes and lets you make the best use of your IT resources. Expanding into new markets, whether by mergers, acquisitions or establishing new offices, is an excellent way to grow market share and compete in a globalized marketplace, yet it also presents challenges to your internal production processes. New markets mean new regulatory requirements and labeling legislation that must be satisfied. Acquiring companies often brings with it diverse IT hardware, systems and printing methods, introducing a variety of labeling processes to a company. Standardizing your labeling process makes it easier to roll out a standard label production method to newly established or acquired subsidiaries. It can unify diverse printing systems to enable a scalable, consistent label production process. In an environment where mislabeled products can result in recalls, legislative action and lasting brand damage, strong quality control measures are an absolute must. However, this can be a challenge when dealing with manual data entry processes and disconnected label databases. Multi-site label production further complicates the process, as errors could occur at any point along the supply chain. Standardized label management enables you to automate your quality control processes. It gives you a single source of truth that you can use to verify label information. It also enables you to distribute label changes and updates to the relevant production sites quickly and efficiently. 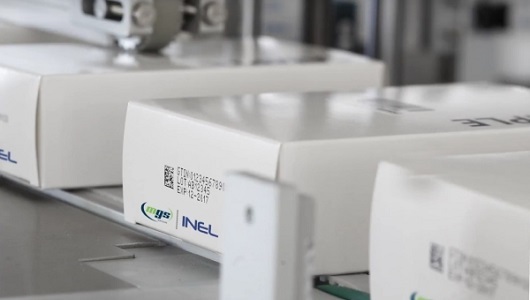 NiceLabel has helped tens of thousands of organizations in every industry increase productivity, improve quality and become more competitive by introducing standardized label management. See what NiceLabel can do for your organization. Visit our pharmaceutical solutions page to learn more. IN PHARMA INDUSTRY LABELING IS THE MOST IMPORTANT PART, LABELING INCLUDES THE INFORMATION OF COMPOSITIONS , DOSAGE, STORAGE AND OTHER INFORMATION.